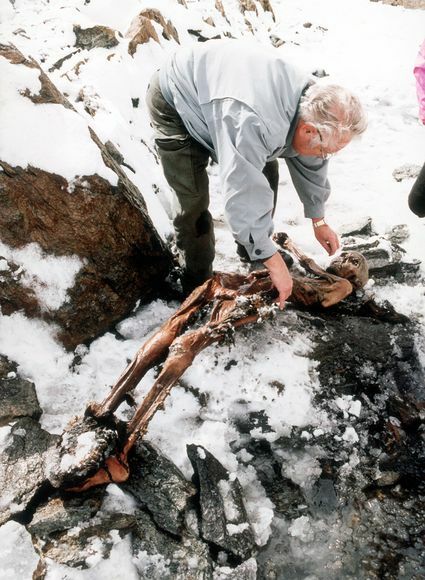 In 1991, near the border between Austria and Italy, the body of the Similaun man, also known as Oetzi, was discovered. The body, that was incredibly preserved, dates back to approximately 5300 years ago. How was it possible to assess when Oetzi lived precisely? Dating any item containing organic material, as for example a piece of wood or animal remains, is possible by analyzing the percentage of 14C that the material still contains. The radiocarbon or 14C dating method was developed between 1947 and 1949 by the chemist, Willard Libby of the University of Chicago, for which he received the Nobel prize in 1960. It is an absolute dating method which has also enabled the verification of the stratigraphic dating method, a method based on the identification of homogeneous layers of ground in order to obtain information on the nature and the date of the archaeological site. The radiocarbon technique instead, enables absolute dating of any material of organic origin, and also materials that are inorganic which have however been generated by living organisms. In both cases the method works so long as over 60 thousand years have not passed. In older samples it is practically impossible to find radioactive carbon atoms that still have not died. Each element of the periodic table differs from the others in the number of protons in its nucleus. For example all hydrogen atoms have one proton in the nucleus, while carbon atoms have six. The number of protons in the nucleus is called atomic number, while the sum of the particles of the nucleus (protons and neutrons) determines the mass number. What can change between two atoms of the same element, is the number of neutrons in the nucleus, and therefore the mass number. The atoms of the same element with a different mass number are called isotopes since they occupy the same position in the periodic table. Among the isotopes of an element there always is one that is more abundant, while the others are present in small quantities. For example, in nature there are three carbon isotopes; 99% is represented by 12C, the rest by 13C and 14C. Some isotopes, such as 14C are unstable, they transform into progressively lighter nuclei (decay) emitting particles or radiation. For this reason such isotopes are defined radioactive isotopes. In 1900 the physicist and chemist Rutherford, Nobel prize for Chemistry in 1908, discovered that the number of particles emitted by a radioactive substance is not constant in time, instead radioactive decay is a statistical process that follows an exponential theory (which is the same for all forms of radioactive decay). There are three types of radioactive decay, known as alpha (α) decay, beta (β) decay and gamma (γ) decay, depending on the capacity to penetrate through the matter; α particles (nuclei of 42He) are the least penetrating, β particles (electrons or positrons) are intermediate, and γ rays, i.e. photons are the most penetrating. In 14C decay, a neutron transforms into a proton and an electron. The latter is expelled from the nucleus in the form of beta radiation. In this way 14C is transformed into 14N, which is stable and therefore not radioactive. For all radioactive decay, the half-time, i.e. the time required for half of the radioactive nuclei to decay, can be defined. For 14C half-time is 5730 years. All living organisms contain carbon, in fact, when living they exchange carbon with their environment. For example plants store carbon dioxide (CO2) obtained from the atmosphere through chlorophyll photosynthesis. In the CO2 exchange, all organisms absorb the carbon isotopes, in the same proportion as they are present in the atmosphere, i.e. 14C/12C =1.2 x 10-12. When a living being dies, carbon absorption is interrupted, and as a consequence, due to the decay of 14C , the 14C /12C ratio decreases progressively. Bearing in mind the half life of 14C, it is therefore possible to determined “when” the carbon exchange with the external environment was interrupted. With this method it must be supposed that the activity of 14C present in the atmosphere was always constant and equal to the value dating back to 1950. Actually it is not exactly so, just think of the large amounts of 12C that were introduced in the atmosphere from the times of the Industrial Revolution, generated by the combustion of fossil coal, that “dilute” the 14C that is present. Also the nuclear experiments in the atmosphere have led to the production of new 14C . For these reasons the calibrated 14C method is used, which also bears in mind the variations in 14C activity in the course of time. The dating of the holy shroud which, according to some, was wrapped around Jesus’ crucified body, was carried out in 1988 with the 14C dating method by three independent laboratories. The results assessed , extremely precisely that the shroud dates back to a period between 1260 and 1390 which is very far from the time of the crucifixion. Is it possible to date items that are more than 60 thousand years old? Potassium-argon dating exploits the transformation of 40K to 40Ar by capturing an electron. If a rock contains 40K, with the passing of time this will transform into 40Ar that accumulates in the material. From the measurement of the amount of 40K and 40Ar in the sample, it is possible to make an estimate of the age of the item. With this method it is possible to date items aged between 2,000 to 4.5 billion years, since the half-life of 40K is 1.3 billion years. One of the most famous items that were dated with this method was certainly the 3.4 million year old Australopithecus afarensis specimen. 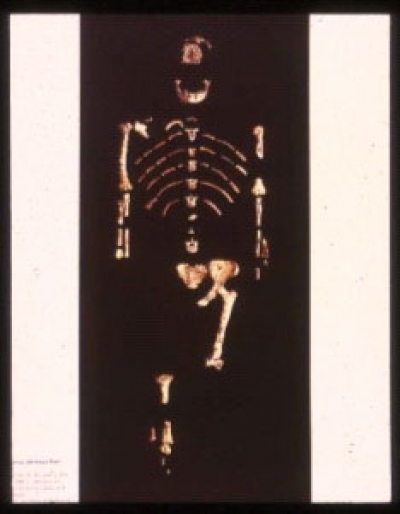 The specimen, whose name in code was A.L. 288, was re-baptized with the name Lucy, in honour of the Beatles’ song Lucy in the Sky with Diamonds. Astrophysicist and science populariser, Ms Romaniello is responsible for training and development, and installation of museum exhibits for the Turin Planetarium.